Toolbar—Use this to compile, run, and stop your script. Buttons are also available for showing and hiding the accessory view pane and the bundle contents pane. Select View > Customize Toolbar, or Control-click on the toolbar and choose Customize Toolbar, to choose what buttons displayed in the toolbar. Navigation bar—Use this bar to select a scripting language, target an app, or navigate through the handlers in your script. The navigation bar currently only supports navigation of AppleScript handlers. Editor pane—Write your script code here. Accessory View pane—View and edit your script’s description here, or browse the result and events produced when your script runs. Bundle Contents pane— Edit the identifier, version, and copyright info for your script here. You can also use this pane to add, remove, or manage resources contained within the bundle. 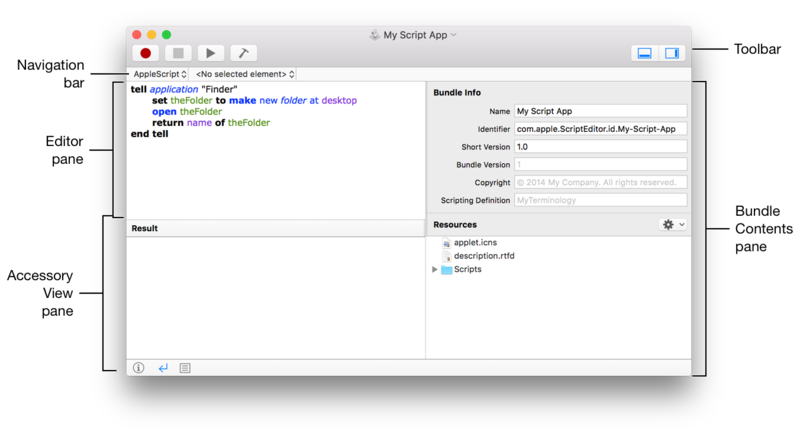 This pane is accessible only when your script is saved in script bundle or app format. When you create a Script Editor document, select a scripting language in the navigation bar. See Figure 5-2. 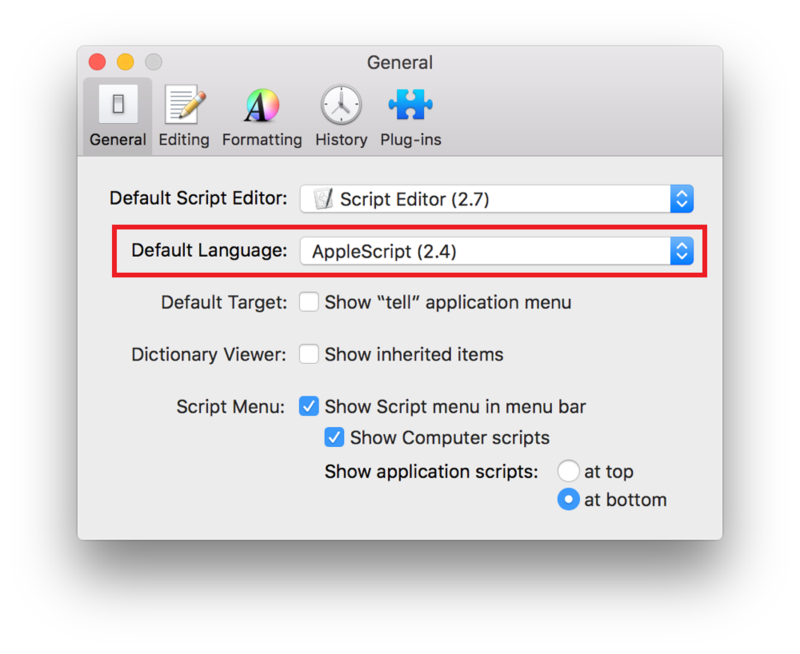 If you always use the same language, set it as the default in the General pane of Script Editor preferences. See Figure 5-3. Script Editor can display the result of executing a script, as well as a log of events sent and received during execution. A result is a value generated when a script statement executes. 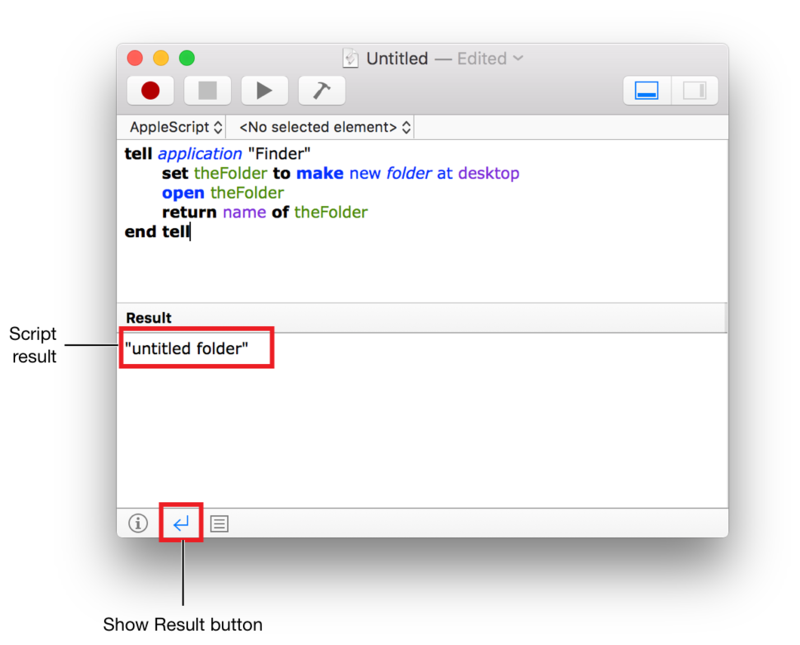 For example, executing the make command to create a folder in the Finder produces the newly created folder object as its result. The result of a script is the result of the script’s last statement. If the script’s last statement doesn’t produce a result, then the script has no result. The result of executing your script—if a result was produced—is found in the Accessory View pane. See Figure 5-4. Choose View > Show Result. Click the Show Result ( ) button at the bottom of the Accessory View pane. The Accessory View pane also contains a script log. See Figure 5-5. The script log displays the following information. Result—The result of executing your script. Messages—Includes log messages generated as your script runs, as well as the script’s result. Events—Includes log messages, the script’s result, and events—commands—sent to applications. Replies—Includes log messages, the script’s result, events sent to applications, and event replies. Choose View > Show Log. Click the Show Log ( ) button at the bottom of the Accessory View pane. 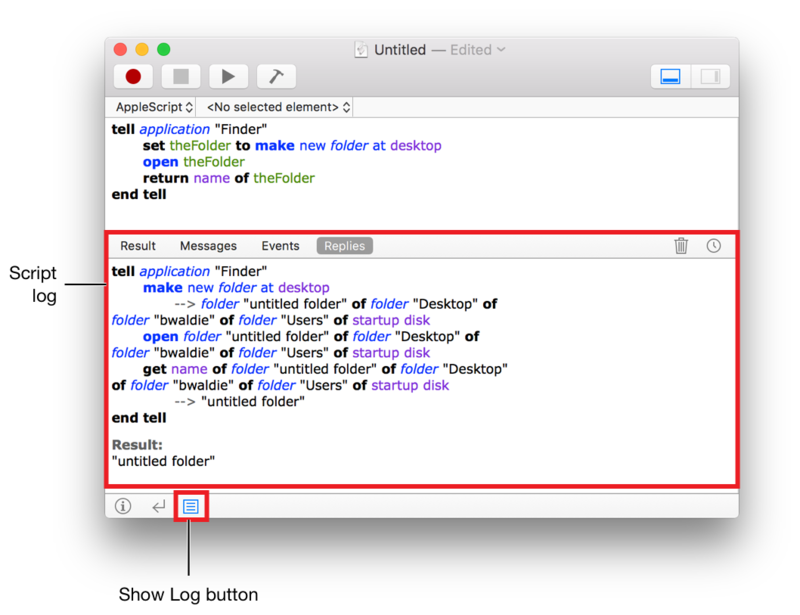 In AppleScript, log messages are generated using the log command. See Listing 5-1. Since the log command targets the script itself, you must explicitly use the me keyword to direct it to the script when calling it within a tell statement. See Listing 5-2.
tell me to log "My log entry." The result and script log areas in the Accessory View pane reset each time you run your script. 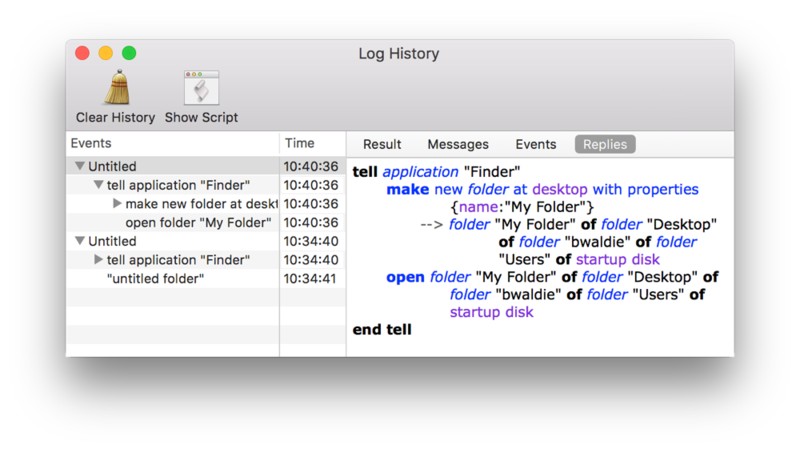 However, you can view historical logs for an opened script in the Log History window. See Figure 5-6. Choose View > Log History. Click the Log History button ( ) in the top right of the Accessory View pane.